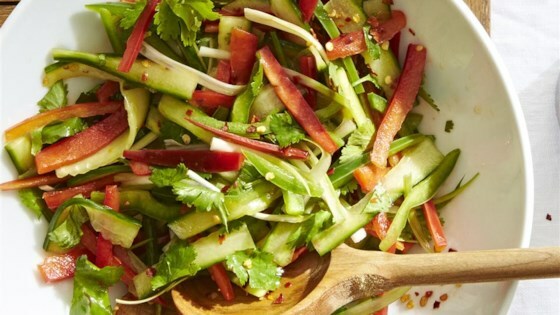 "This is a popular salad from Northern China that's gaining popularity in the United States. Toss in peanuts, shrimp, or tofu for some protein." Cut cucumber in half lengthwise and gently scrape out seeds with a spoon. Cut each half crosswise into 2-inch pieces. Cut each piece lengthwise into thin, uniform strips and transfer to a bowl. Toss cucumber with 1 teaspoon salt and let stand 15 minutes. Meanwhile, cut green onions and bell peppers into thin, uniform strips, about 2 inches long. Transfer cucumber to a fine-mesh sieve, rinse, and drain well. Whisk together vinegar, sesame oil, crushed red pepper, and remaining 1/4 teaspoon salt in a large bowl. Add cucumber, green onions, bell peppers, and cilantro, and toss well. This was AMAZING! Perfect blend of seasonings. Don't change a thing!! I usually make just a cucumber salad using similar ingredients. Adding onions and peppers and scallions was great. Really nice recipe. I used a bag of mini red and yellow peppers, nice color and flavors. Delicious and light! Followed recipe exactly. Thanks so much for sharing.